You can have fun making this moist pumpkin spice cake all alone or have even more fun making it a family project, especially with the kids. You won't be disappointed. The recipe includes a homemade pumpkin spice and a delicious sour cream frosting. 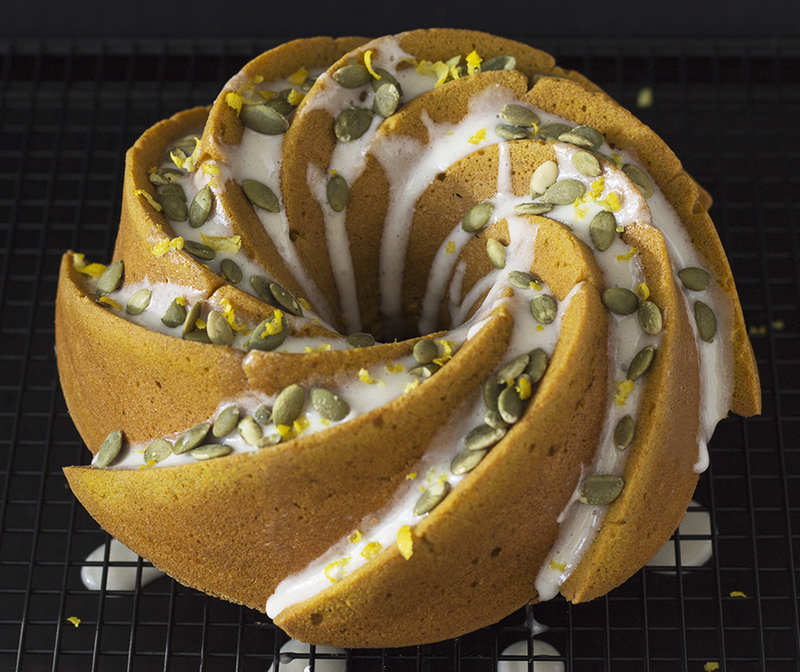 Topped with roasted salted pumpkin seeds and a dash of lemon zest, the flavors with have you going back for more! Preheat oven to 350 degrees. Spray bundt cake pan with a non-stick oil and flour mixture. You can substitute this by coating the inside of the pan with a thin layer of butter. Add and shake a thin layer of flour. Be sure it spreads throughout the pan and then shake out any excess flour. Equipment: 10" bundt cake, not the tall 10" bundt cake but one that has a lower height. I had used a 6 cup but small height bundt cake. Three separate mixing bowls. Whether using a hand mixer or a stand mixer. reserve the largest bowl for creaming the butter and sugar. The final step for making the batter is to add in alternate steps, the dry and pumpkin mixtures to the creamed mixture. Mix all the dry ingredients in bowl and set aside. In a separate bowl, stir together the ingredients for the pumpkin mixture. Using the last and largest bowl, cream the butter and brown sugar. Add the brown sugar to the butter 1/2 cup at a time while mixing the ingredients. Then, while continuing to mix ingredients, add in one egg at a time, ending with the egg yolk. Your creamed mixture should be light and fluffy. Blend together all ingredients until smooth. After the bundt cake has cooled, dribble frosting over cake. Top with the roasted salted pumpkin seeds and lemon zest.